One of the trifectas of the Bronze Age, along with Spider-Man #129 and Hulk #181, the Giant-Size X-Men #1 ushered in a new era and a new breed of comic book characters. A more dynamic group of heroes to reflect the times and transition the medium of comic to new heights. 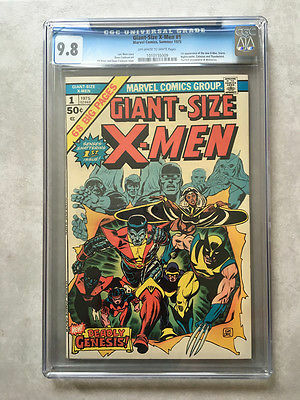 On offer here, from my personal collection is one of the 3 big heavy weights from the Bronze Age: Giant-Size X-men #1, certified 9.8 with a near perfect page designation of off-white to white pages. Please ask the questions that are important to you. I will respond to all questions within 24 hours. Serious buyers only please. No returns on certified books.